Can we have a heart to heart now? It’s the end of August which also means we’re onto Labor Day weekend (here in the US). Where has the time gone? I’m not ready for the end of summer yet. See? I’m still making pesto with the basil from my kinda sorta pathetic herb garden. I’m actually going to need to cut my plant back more and make even more pesto. Into the freezer it will go! I keep seeing posts on twitter and facebook about pumpkin spice lattes at Starbucks. I’m not ready yet. I’m still into pesto and tomatoes. And I even have a couple of more pesto-related recipes to share with you next week. This Florida girl is holding onto summer as long as she can. 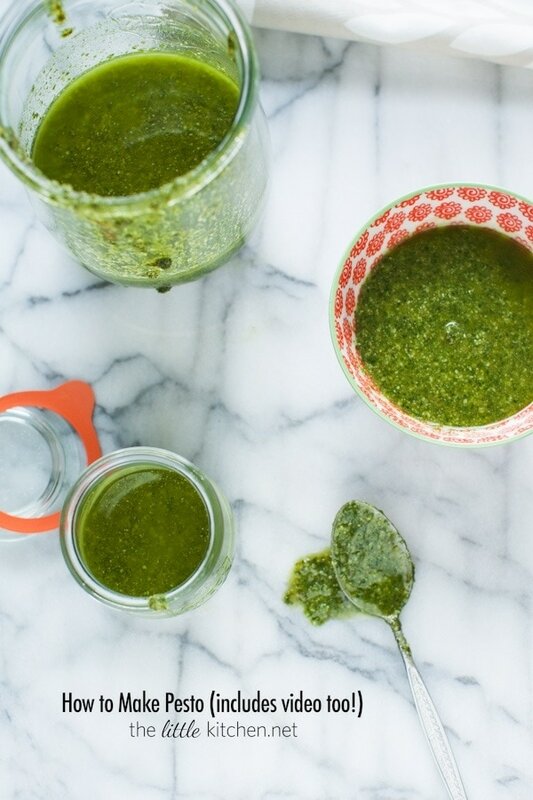 Have you ever made pesto before? Then, you know how easy it is. If you haven’t, it’s soooo easy, here’s a video too! I used my KitchenAid 12-Cup food processor but I even tried it with my blender and it worked great! Do you remember your first time eating pesto? Growing up, I’m first generation American, we had a lot of Vietnamese food at home so I don’t remember having pesto pasta until I graduated high school. I received a scholarship from a really nice family who tragically lost their son his sophomore year of college in a drunk driving incident. The other car’s driver was driving drunk and unfortunately Chad Bogan lost his life. The scholarship was named in his honor and I was honored to receive it. Chad’s parents took me out to dinner because they wanted to meet me in person and to present me with the check for the scholarship. They took me to a really nice restaurant and I ordered pesto pasta. It was amazing and that started my love for pesto. It’s amazing how some food memories are tied so deeply with a life moment, accomplishment or a memory…I wonder if that’s the same for you? 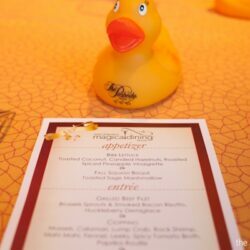 I remember that meal so well and the kindness and thoughtfulness that Chad’s parents showed me. Their generosity in the midst of tragedy has stayed with me all of these years. I only started to make my own pesto at home a couple of years ago and it’s incredibly easy as long as you have plenty of fresh basil. 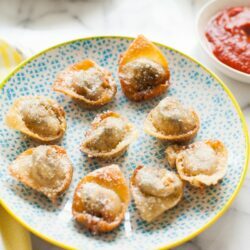 Serve it over your favorite pasta (or even try homemade pasta) or make my pesto caprese fried wontons. Look out for more recipes coming at you soon made with pesto! I used walnuts in my recipe because A. walnuts are less expensive than pine nuts and B. because we found out Curtis is allergic to pine nuts a few years ago. Recipes you can try with pesto sauce! Add all ingredients except olive oil to a food processor. If you're using a blender, add the olive oil and then the other ingredients. While hitting the pulse button, stream in the olive oil until completely processed. Add more salt and pepper if needed. Store in the refrigerator or freezer. Add a layer of olive oil on top to prevent the pesto from browning. Add to your favorite pasta and serve with parmesan cheese. I love this post, Julie! I’ve never made pesto. Big shocker, right? 🙂 Love seeing how easy it was in the video. Hi Joanne, oh my goodness, you just made me tear up! You are so kind! Thanks for being a sweet friend! Hope you both have a nice weekend! Perfect tutorial and great video, Julie – you rocked it! Reminds me I have to make a big batch of pesto before my basil is claimed by the cold! 🙂 Thanks for sharing. Nothing better than homemade pesto, love your video! This is a nice tutorial! I always add a couple things to mine — a few cloves of fresh garlic and a fistful of fresh spinach to make it go further & have a creamier texture. Some folks drizzle a few tablespoons of melted butter in at the very end, which is a nice touch, too. We’ve experimented with using other herbs such as Italian parsley, thyme, lemon thyme, oregano, etc to our pestos and its always a hit. We like to spread some on flattened bread dough and sprinkle with a little cheese for a fun & easy foccacia. Thanks for sharing this! I sell pounds of basil each week, but only have a little pesto in the freezer — reminded me I had best get some made! I love your videos, Julie! This pesto looks like perfection! Gorgeous color on that pesto and it makes me want to whip up a batch! This pesto is gorgeous!! That color is spot on and this video is so well done! As always, I am incredibly impressed. You are one multi talented cook! 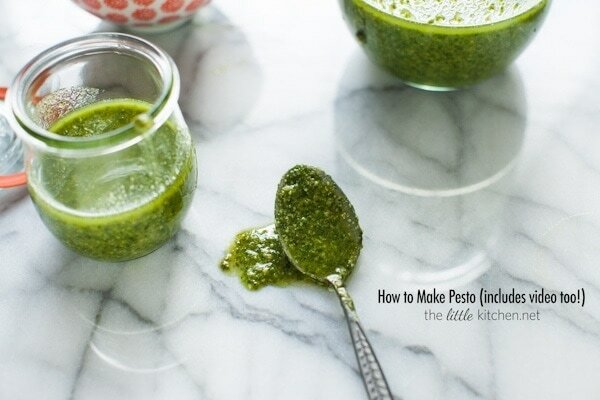 Great pesto recipe Julie and a wonderful video! This is a wonderful post! I’ve never made pesto before, I will now! Thanks! Homemade pesto is one of my favorite things! I am super jealous of all of your basil. No matter how hard I try, mine just can’t survive in the desert! I love to make my pesto with walnuts! My son loves pesto with quinoa. I usually make a spinach basil pesto but I should try just basil. Amazing recipe! OMG, I can almost smell it. I love pesto SO MUCH. My basil did not grow this year and I’m still crying over it! I just posted today about how I’m not ready for fall recipes yet–I’m just not! I couldn’t believe it when I started seeing pumpkin recipes last week, LOL. Making homemade pesto is a great way to end the summer! I’m not ready for fall either, but I couldn’t pass up getting a PSL last week when I realized they were available! I’ve never been very successful at growing my own basil — wish I could figure it out because I love pesto. 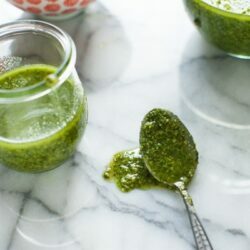 We love pesto but have never made it at home and let’s face it, the pesto in a jar is okay in a pinch, but just doesn’t taste the same as fresh. Will try this recipe, love the look and consistency of yours! Yay, for videos and pesto! Your pictures look great too! Love, love, love pesto! It is nice that you have such a great memory of your first time having pesto and were able to share the experience with that family. We’ve made so much pesto and our basil is still out of control! I can’t keep up! Love the video! We love making pesto. It’s so easy, fresh, and DELICIOUS. Great video, Julie! Super excited about this one… by Basil is almost ready…. can I do this with purple basil? great video 🙂 I seriously love pesto!! I love love love pesto. Your memory of first trying it is so touching. I honestly can’t remember my first taste. I’m going to think about it and try to remember because I know it wasn’t a flavor from my childhood. 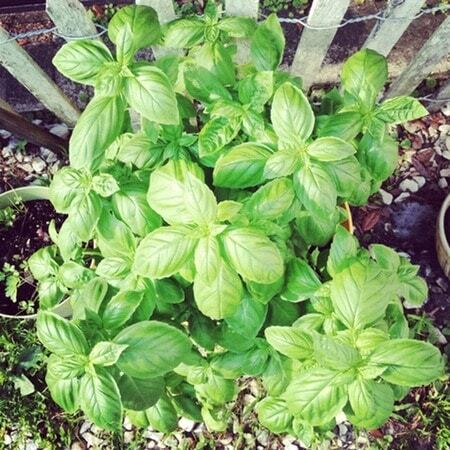 I love homemade pesto, and i have a ton of fresh basil in my herb garden. Love the little jar, it looks like a wech jar, where can i get one like this please?